What? Children still reading? Have you seen one lately? I thought they've all been locked up in converted libraries. But apparently it's not true. 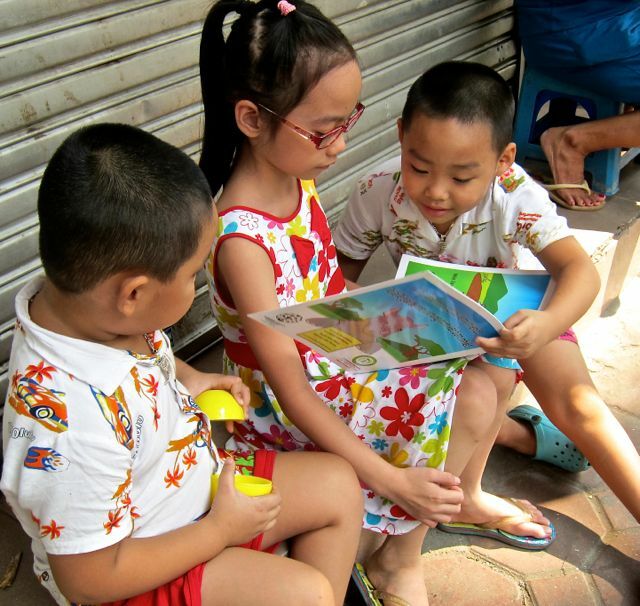 The magical world of Asian fables and tales offer a great opportunity to open your kids' world to other than the familiar. The world of children's literature is growing everyday as more of our offspring discover that the combination of books and imagination creates a universe infinitely larger than the 16 inch screen. Television has to find consensus to have an audience. Writers are under no such restriction and so they imagine worlds and people and ideas that are like spark plugs for the engines of young minds. Imagine with your kids a world of kites, turtles, rivers and the magic these bring to the world of kids in Asia. At the start of the book, Old Turtle listened in silence. All the creatures, the fish, the sky, the mountains, the river and even the moon discussed on who really God is. When the discussion became argument, Old Turtle closed one eye, lifted his head eye and with his ancient wisdom stopped them and shared the essence of his understanding. Old Turtle told them God is deeper than the ocean and over and above the mountains. He is beyond all things and is in all things. God is. And Old Turtle opened both eyes and turned around and saw that everyone was listening and he said perhaps I shouldn't tell you this but you should know that a great blight is about to pour across our paradise. Get the book and hear what the turtle is about to disclose. The turtle is a very popular symbol in Vietnam and in other Asian cultures though this one is not one of the tales in Asia. Still, the Old turtle is not to be missed. Maya comes from a poor Korean family but she unfailingly cared for her father, a child's duty in most Asian families. ​One day, she found a turtle and finding how helpless it was, brought it home and cared for it. She never realized the change this turtle would do to her life. Read about the transformation the turtle brought to Maya's life. This book tells of the story of a powerful Daimyo in old Japan who shared his castle with a plundering rat. This rat smiled and giggled as he hoovered the great Daimyo' s fabulous food and his boldness intimidated the Daimyo's household. Terribly enraged, the Daimyo set forth on a quest to find the sacred shrine that trained samurai cats. The shrine loaned him two ferocious feline fighters skilled in the samurai arts but the rat outsmarted them. So the Daimyo went back to the shrine and asked for their toughest trained warriors with paw to claw rat combat experience. To his surprise, the shrine sent him old screwy, Neko Roshi, the least likely killer kitty ever since. Read about Neko Roshi's encounter with the utterly smart rat. You will be fascinated at how this amazing story unfolded. Can't help but include this one. What a great read aloud book. Until today, I can still recite this story from memory. It is a fairy tale from China about how the Chinese came to give their children short names. Let your kids feast on moon cakes and dumplings, build a kite at Qing Ming or a mini dragon boat for the dragon boat festival. Let this collection of tales and stories bring the magic of Chinese celebrations. Feed your child's imagination with exotic food and symbols. Here's the winner of the 1968 Boston Globe - Horn Book Award for Picture Books, Tikki Tikki Tembo. Cora has been wanting to do grown up chores not just do little things her older siblings ask her to do. ​One day when her elder siblings were out, Cora had her chance to be the major help in the kitchen for her Mother. To her delight, she suggested they cook pancit, her favourite noodles. Learn how to cook this Philippine dish and have a peek at a Filipino family's relationship. This is Kipling's tale of a mongoose taken in by a British family in colonial India and how this mongoose defended his family from the menacing cobras. This is a great book to make kids appreciate not only India and its culture but animals and nature as well. Early in our lives, books from other cultures were what we had and we read these at home and in schools. Only when I visited these cultures did I have a much better understanding but the introduction to them in my younger years made me enter into it in a much deeper way. I often wonder about the many Japanese draw to Prince Edward Island in Canada and all because they read Anne of Green Gables when they were young and would really want to see the house where she lived. Books are truly windows to other worlds, to many worlds. 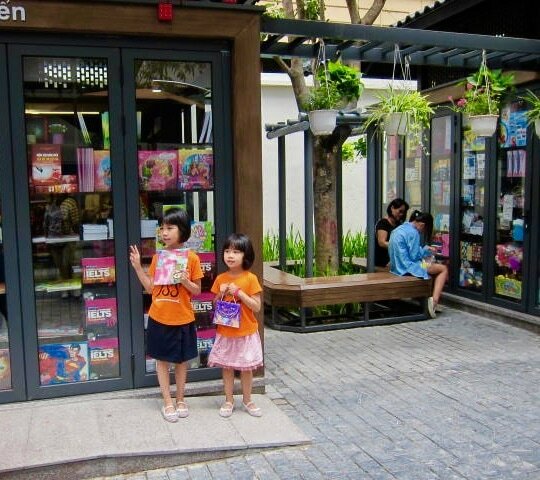 Recently, in Hanoi, a street significant in history was transformed into Pho Sach, a book street. Families come and enjoy browsing books from several stalls. Authors also have book signing and promotion. Take a look at the picture and click on it to read more about this wonderful move to make kids become readers.